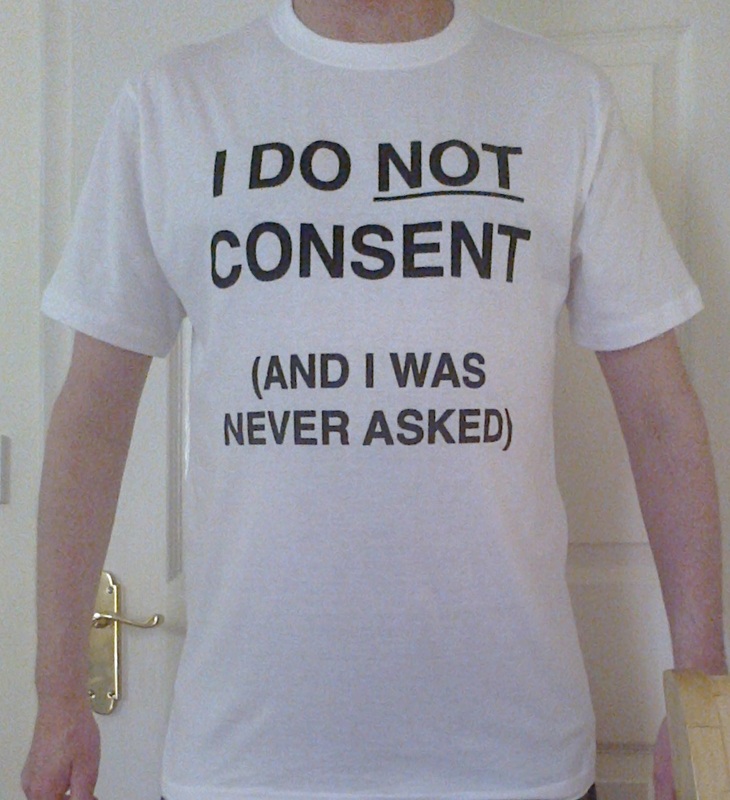 I’ve had a batch of these ‘I Do Not Consent’ T-shirts made up, suitable for sporting at all kinds of events and situations. 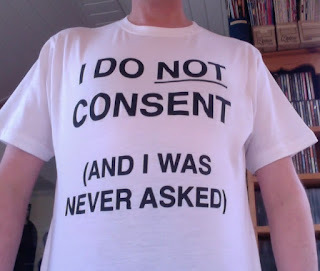 These represent a simple but direct statement of response to the tenets of tacit approval and presumed consent under which the “elites” arrogantly carry out so many of their activities. 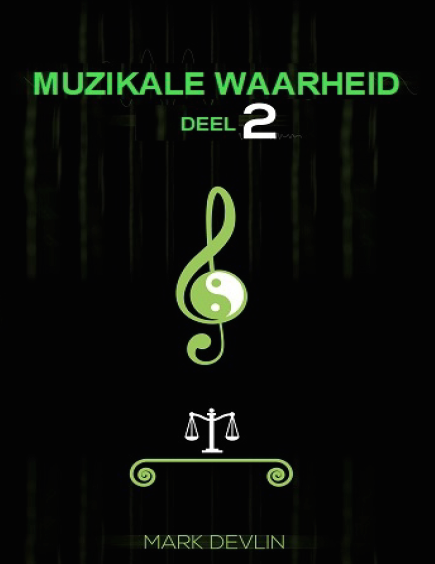 By making it clear that we do not choose ANY any part in their deceptive and manipulative agendas, we are making it clear that THE ENTIRETY of the karmic judgement for their wrongdoings and violations of our Natural Law rights, falls fully on to them. No more passing the buck (as they see it) through trickery and deception. I feel this is a powerful message communicated. And if nothing else, the slogan will stand as as a useful conversation starter with strangers! I’m happy to be able to release the footage of my presentation delivered on the Advocacy Stage of Anarchapulco in Mexico, on Friday 15th February 2019. 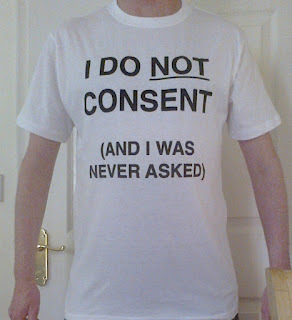 In a conveniently compacted 30 minutes, I advocate the jettisoning of all personal heroes, gurus and role models on the grounds that, anyone who has a prominent position in the public eye will have been placed there in order to have a controlling effect on societal attitudes, and to serve some social engineering agenda or other. The ONLY solution to avoid the risk of being taken in and bamboozled, therefore, is ... No More Heroes. Big thanks to David Rodriguez for filming and hosting. Listen to "GVP #140 - Mike Williams - The McCartney Deception" on Spreaker. Mike Williams, aka Sage of Quay, rejoins me to discuss various aspects of the Paul McCartney replacement, many of which have not been discussed in these contexts before. Along the way, we discuss dark occult aspects of the Beatles, and evidence of their ties to military-intelligence mind-control and social-engineering programmes - the only circumstances in which a stunt of this magnitude could have been successfully pulled off. Here is a full Dutch translation of my book, ‘Musical Truth Volume 2.’ Once again, huge gratitude goes to Erick Van Dijk for undertaking the monumental task of translating. This is the footage to my presentation at the Keep Talking group in London, delivered alongside Dr. Nick Kollerstrom on 7th February 2019, examining the evidence that there has been more than one "Paul McCartney" presented to the public, and considering some of the theories involved. Big thanks to Alan Bariffi for a great job of filming and editing this video. Comments have been disabled as this subject has shown itself to be even more divisive than Flat Earth, and I have zero interest in entering into an opinionfest. These are my observations on the matter, presented on MY own channel. Anyone who wants to contradict, argue or debate is of course free to do so ... on THEIR own channel. Listen to "GVP #139 - Vegan Agenda Roundtable" on Spreaker. A highly topical subject comes under the spotlight for a four-way roundtable discussion. Sean McCann, Jo Lomax and Nathan Riddett guest to discuss the current social-engineering push to promote Veganism. We all agree that the reason this is getting done WON’T be out of the elite controllers' compassion and concern for all living sentient beings - particularly when the likes of Bill Gates, Richard Branson, Russell Brand and Beyonce have been playing their part in the push. This leaves us to reflect on the REAL reasons for the co-ordinated agenda, now being ramped up at record speed. The show ends with Sean McCann giving his thoughts on Carnism, (meat-eating,) as depicted in Stanley Kubrick's mindblowing '2001: A Space Odyssey' movie, and its relation to the Biblical creation myth, Darwinism, satanism and human consciousness.